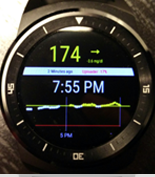 Access to blood glucose values, your own or a T1Ds, on a watch is an unparalleled feature for many people. The great news is that there are options for every setup and for Pebble (all varieties), AndroidWear, Apple Watch, and more. Note: Pebble (a popular watch option in the CGM in the Cloud/Nightscout community) was acquired by FitBit in December 2016. Pebble watches currently still work, but there will be no more updates to the Pebble app. If your phone updates, and the Pebble app no longer works, you may have a problem. Nightscout Foundation representatives have been in contact with FitBit to talk about future direction/options. The watchface you need (or can use) depends first on the kind of CGM in the Cloud setup you have and then on the type of watch. 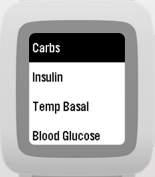 The CarePortal app for Pebble allows users to log CarePortal data (e.g., carbs, insulin, bg) directly from the Pebble. This data then appears on the Nightscout site and is factored into features like IOB, COB, etc. 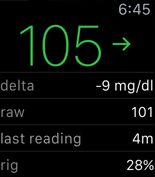 If you are using xDrip, you can have data sent directly to Pebble or AndroidWear. 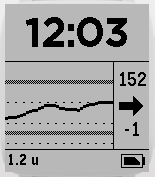 The newest xDrip face for Pebble is part of xdrip Beta 6 and not downloadable separately. 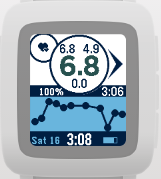 To use this new face, select “Send to Pebble” from the xDrip settings. 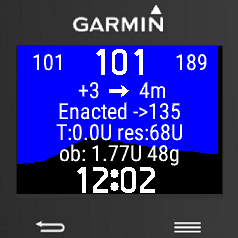 You will be prompted to install the face and can configure the display options within xDrip settings. See the Camping/Offline Mode section below for other options. Pebble: Camping Mode (offline watchface for someone using the Nightscout uploader app) Note: you may need to install both the Pebble (old) and Pebble Time apps to make this older watchface work. In the past, CGM watchfaces have not been available on Gear watches because Gear uses the Tizen operating system. 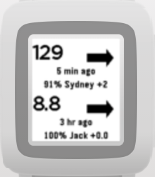 A community member recently confirmed success using Wearable Widgets and the xDrip app widget. 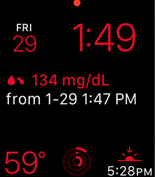 (This setup would be for a T1D wearing a Gear watch.) 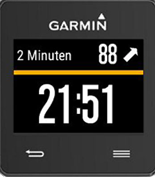 Followers may wish to try Wearable Widgets with the Nightwatch app widget. Nightwatch can be configured to follow Nightscout or Share/G5 data.